This still hold true, according to our investigation into dozens of studies about black health across multiple disciplines. More than any other single group, the black community is most likely to have negative health outcomes, including higher rates of breast and prostate cancer, high incidence of HIV/AIDS, higher rates of infant morality -- along with high rates of childhood obesity and asthma in young adults. "In terms of the disparities, it’s universal," she said. 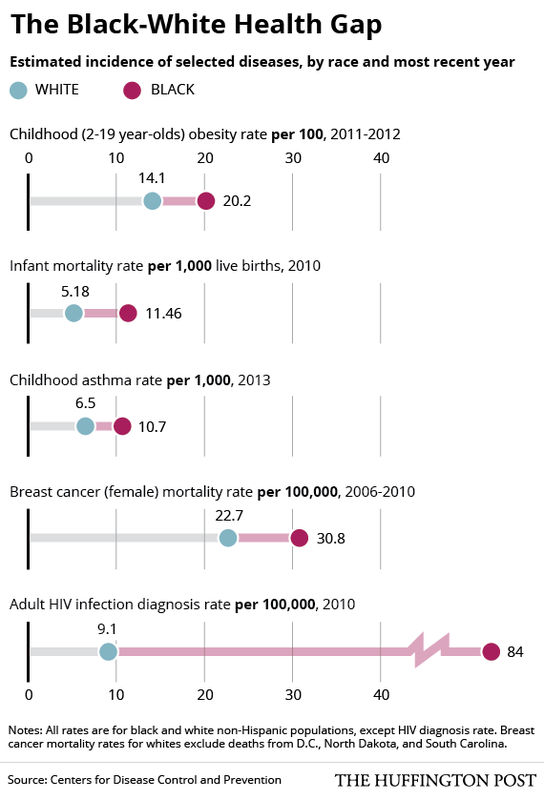 "There are disparities across almost every single disease entity." Socioeconomic inequality accounts for much of the difference. Twenty-seven percent of people living in poverty are black, and studies consistently show that the least educated and lowest income people are the most likely to be unhealthy. "Financial status directly impacts health status," Winkfield said. "They are inseparable. That’s the problem in this country -- people make the assumption that people can just do. Well, you can’t. If you don’t have the resources, you’re not going to be able to care for your health in the appropriate way." But inequality alone doesn't account for the difference. Policy can address differences in access and income, but research finds that unconscious racism is far more insidious and harder to legislate against. Fully two-thirds of medical professionals display unconscious racial bias. And research has also shown that racial bias can lead to reduced trust between patients and their doctors, and causes black patients feel less respected by their doctors. "Layered on top of those social class inequities are racial inequities," said Dr. M. Norman Oliver, director of the University of Virginia Center on Health Disparities. "While a poor, working-class white or a poor Appalachian white might have the same poor health standards as folks in inner-city Baltimore, the population attributable risk of being in that poor status is much higher in the African-American community. That’s a result of that racist discrimination being layered on top of the class inequities that we have." These improvements, however, have limits. For individuals who didn't benefit from the ACA's expansion of Medicaid, and had to buy health insurance through the health care exchanges, there may be no increase in health care access at all, said Oliver. "It’s a little problematic in that most folks can’t afford anything other than the high-deductible plans," he said. "Even though they have insurance, it doesn’t necessarily increase their access, because they can’t pay for things out of pocket." Why is this happening? Socioeconomic factors including income, education, and occupation can mean fewer resources, less access to quality health care and worse health outcomes. In addition, life-saving clinical trials may be financially impossible for working-class women who can't afford to miss a shift. As it stands, only five percent of clinical trial participants are black. "The advancements in screening tools and treatment which occurred in the 1990s were largely available to white women, while black women, who were more likely to be uninsured, did not gain equal access to these life-saving technologies," Bijou Hunt, an epidemiologist at Mount Sinai Hospital in Chicago, told Reuters last year. "We know that one of the leading causes of infant mortality among African-Americans is preterm birth," Michael Lu, an obstetrician-gynecologist and professor at the University of California at Los Angeles told McClatchy DC in 2007 when studies suggested stress may play a role in the long-stubborn mortality discrepancy. "We know that stress is an important risk factor, and it initiates the release of stress hormones leading to preterm birth and increase susceptibility for infection. The question is, do we think racial discrimination and racism is stressful?" The answer to Lu's question is "yes." While existing peer-reviewed research on the psychological effects of racism on people of color is limited, psychologist Monnica Williams, a professor and director of the University of Louisville’s Center for Mental Health Disparities, believes there is a link between racism and post-traumatic stress disorder. "It’s a natural byproduct of the types of experiences that minorities have to deal with on a regular basis," she said in a New York Times interview in June. "My training and study has been on post-traumatic stress disorder for a long time, and the two look very much alike." Why is this happening? Obesity is a tricky and somewhat circular issue. One possible contributing factor to childhood obesity among black children that they are less likely to be breastfed than white children. According to the World Health Organization, formula-fed infants tend to consume higher protein levels, which can lead to weight gain and obesity development later in life. Breast milk also contains important hormones that may contribute to healthy weight balance. Breastfeeding is not, however, always an issue of personal choice. That black women generally tend to make less money and be less well-educated are barriers "because you can't access jobs where you might have a maternity leave, or can negotiate a private space to pump, or feel you are able to nurse at work," Monique Sims-Harper, director of A More Excellent Way Health Improvement Organization and a spokeswoman for the California Breastfeeding Coalition, told the BBC. While there may be a genetic component to asthma, poverty seems to be the overwhelming risk factor. As of 2013, almost a third of people living at the poverty level were black. Poverty can also contribute to other health behaviors that can cause or worsen asthma. According to NPR, "Second-hand smoke is also a risk for children, and poor people tend to smoke more. And people in poverty, no matter where they live, also experience day-to-day stress." Over the next few months, The Huffington Post will shine a light on racial disparities in health outcomes and care as part of our series, Black Health Matters.